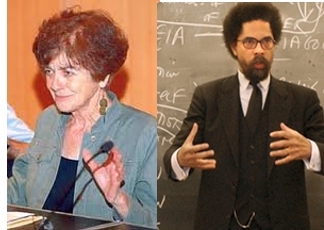 DSA Honorary Chairs Cornel West and Frances Fox Piven are organizing a National Teach-In on Debt, Austerity and Corporate Greed (and what YOU can do about it). More than one hundred campuses have signed up to participate in the teach in. Scheduled for April 5th at 2 p.m. (Eastern Daylight Savings Time), the event seeks to counter the drumbeat of right-wing propaganda. Content will be streamed live to teach-ins organized in local communities from the national teach-in at Judson Memorial Church in New York City. The local teach-ins will use the streamed material and add their own speakers that focus on their community. DSA has endorsed this program and is encouraging local groups and YDS chapters to organize local events that connect to the national teach-in. Jobs with Justice, the Student Labor Labor Project, and others are promoting the teach-in. To sign up, click here. Among the experts participating in the teach-in are economist Jeffrey Sachs of Columbia University. Heather McGheee of Demos, and Richard Trumka, President of the AFL-CIO. To join that movement and escalate the activism planned in the days, weeks and months ahead we are organizing a “National Teach-in on Debt, Austerity and How People Are Fighting Back.” The live web cast Teach-in will be streamed on Tuesday, April 5th, 2011, from the Judson Memorial Church in New York City, beginning at 2:00 PM EDT. Admission to Judson is free. Social justice experts and activists from around the country will be hosted by moderators FRANCES FOX PIVEN and CORNEL WEST in New York City through a live web cast that you can join by organizing a teach-in on your own campus.